Welcome to Moordown Bowling Club website. We are situated in Moordown, in the heart of Bournemouth, and are a friendly group of bowlers and look forward to welcoming new members. Bowling is a very relaxing and interesting sport and is a game suitable for people of all ages. It is played on a specially prepared grass surface called a green or rink, and great care is taken of this throughout the year to keep it looking its best. We play in many divisions, friendly matches and competitions. 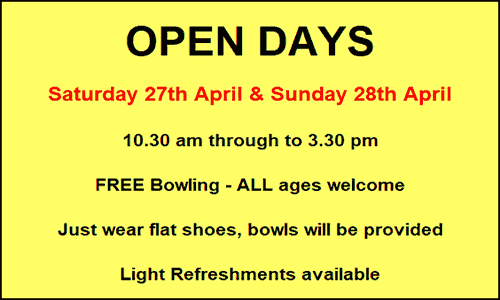 Our annual Open Day, usually held in April, is a 'Taster Session' to introduce the game of bowls, and everyone in the community is invited to come along and play for free. This is also the beginning of the outdoor bowling season for the club and just outside the Bowling Pavilion is a pergola where the wisteria is in full flower, so it always seems a magnificent time of year. If you require any further information about Moordown Bowling Club or our activites please contact us. We are grateful to all our sponsors. Please visit Our Sponsors page for details.